As a community, and in the spirit of Mary MacKillop, we acknowledge the sacred in all creation and celebrate this through ritual, personal reflection and in our every-day relationships. We strive to make Jesus’ concerns our own and seek to build just relationships within our College community and beyond to the wider Earth community. The beginning of the school year is celebrated with Eucharist, the source and summit of our Christian lives. Each day begins with prayer, remembering those who are in need and giving thanks for the riches of creation. Offering nourishment to each person within the college community, students, staff and parents are invited to enter into times of reflection and retreat. During the year the community gathers for formal rituals to celebrate the liturgical year and moments within our own story. 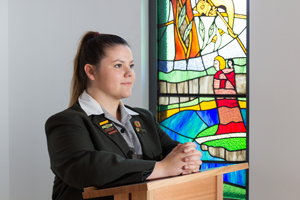 The MacKillop Day ritual in particular seeks to reflect the thirst for justice which inspired so much of the work of Mary MacKillop and which continues to motivate those of us who follow in her footsteps.